Hello! Here are the prettiest vintage red lipsticks from Cheap Makeup at Vintage Fair and all of my other new favorite things. 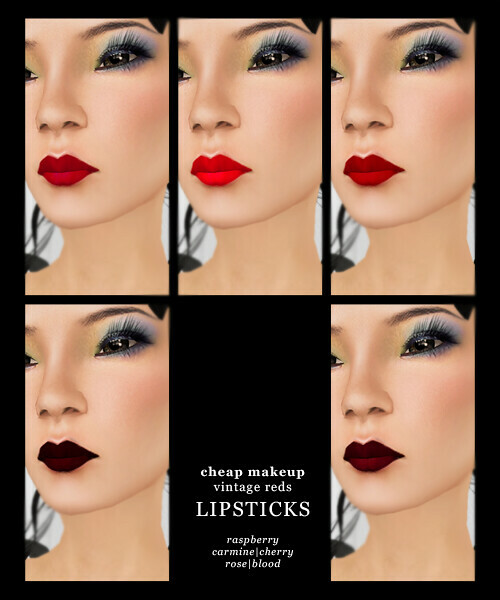 Cheap Makeup‘s handpainted lips are completely different with every release so it’s nice to match them with various skins – even if the other CM lipsticks didn’t quite suit your skin of choice, I think these new lipsticks would! They’re still on my mouth after a few daily skin-changes and I have the feeling they’ll be my go-to red lipsticks from now on. I’m most attracted to the brightest Carmine color actually. 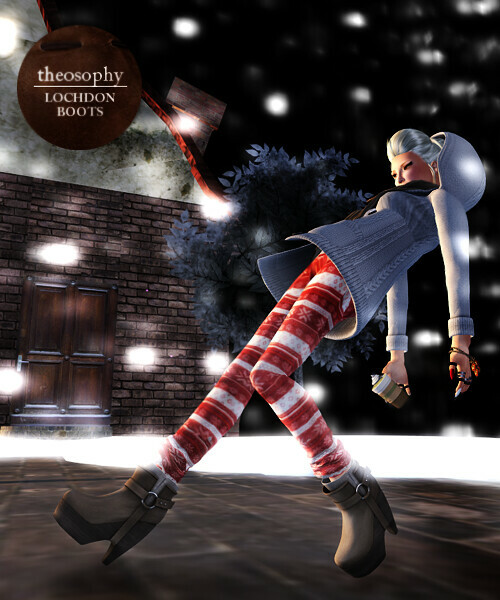 These Beetlebones Mesh Slouchy Suspender Pants were hailed with happiness on plurk haha! Suetabulous Yootz was one of the first few people to create gorgeous mesh items and I remember being really excited to demo them because they looked beautiful in the ad which showed all the ways that mesh pants can move seamlessly. I modified my fats a bit to fit into the S size and I’m happy with the result. It took me awhile to decide which color to buy because I was deciding between blue, the darker blue and grey. I’m kind of awed by the way that the pants look so smooth and flowy, especially the pocket wrinkles – SUE! You are damn talenteds canz. The u.f.o knotted headband is something dearly treasured because I remember playing the u.f.o. headband gacha with Tomoyo, and Tomoyo even helped me play some of it(I gave her money then she paid the vendor. Haha!) because i was darn unlucky and I kept getting the “other” kind of headband instead of this precious knotted one that I super-wanted. (Even though Tomoyo likes the other kind better!) I just visited u.f.o‘s store, bought a pretty top and won some lucky boards, check out u.f.o! I have really missed blogging and I hope I’ll catch up soon enough! Just wanted to share two of my favorite hairs from RAW HOUSE by Jay Khaos. I purchased these a while back but I still wear them over and over again, RAW HOUSE is definitely a brand that I excitedly demo new releases from. I’m really glad that Jay does regular releases, gives a ton of group gifts and participates in weekly sales/events so that his hairs are affordable for all! I think RAW HOUSE has some very recognizable hairs and Jay’s style as a hair creator is super unique, I love his work! Hello! Some releases from FIR & MNA that I really wanted to show. Rob has been making lots of shoes lately and I think his shoes are getting more and more amazing! Check out the quality. You can even pick his new releases up at bargain prices during 50L Friday, so do join the subscribo to keep yourself updated on these deals. I was especially enthusiastic about the Hangover Pants – super impressed by the detail at the cuffs! You can see the lines on the cuffs in the closeup of the shoes (last two pictures) and I love that they look exactly like the sort of elastic cuffs of yoga pants in RL, not to mention the slouchy folds on the cuff sculpt. I did not photoshop the shoes or the pants – you can also see that the joining part between the pants cuff and the pants is blended really well! I probably don’t need to say much about the shoes, they are a real deal at just 250L per color for the Highcrest Boots and 200L per color for the Ryall Loafers. Both are unisex and resize scripted for the perfect fit. I’ve taken close-ups of them to show the detail that you get! Also wearing Black Matte Eyeliner from Cheap Makeup, comes in other colors and is a great basic. bowler hat from 50LF from Xen Store, I tinted it blacker. my everyday beautiful jewellery from shade throne and Kari alphabet bracelet. I love multiple attachment points! Earrings from skinpop, unavailable now. Hi! 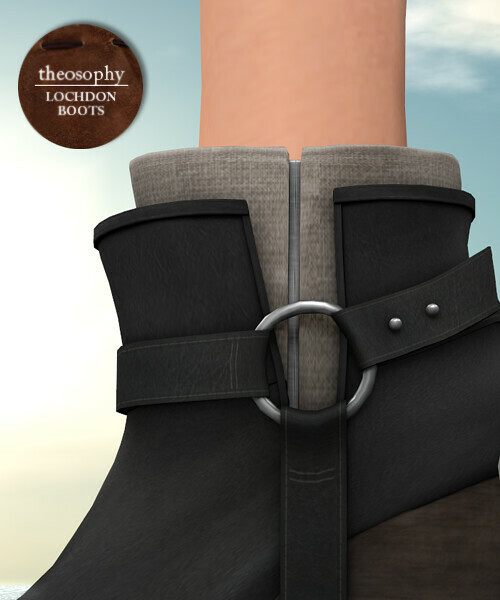 I’m really honored to show you the Theosophy Lochdon Boots today! I tried wearing them with two different looks and I thought they worked well. I love harness boots in real life and I’m so happy that Trace made a really good pair in SL. One of the great things about these boots is that they work well with both winter or summer looks, I wear my real life ones a lot and I live in a tropical country. I thought that it’s a good choice for Trace to release these while we’re sort of in-between seasons. I think they’re an excellent staple, however you choose to style them. I definitely see myself wearing these a lot in the future! Right boot in coal, with tan lining. Left boot in slate, with moss lining. Other things that stood out for me were the textures, especially the metal. Even from a little distance away, the shine looks very realistic. I looked closer with ctrl+0 and noticed that the leather itself has wrinkles and slight distressing just like real boots would. I also like that the wood platform base has shadows on it. Something else that shows Trace’s attention to detail was the fact that the leather harness really looks as though it is gripping the platform, it’s shadowed and curved as though it’s stretched tightly over the boot heel. 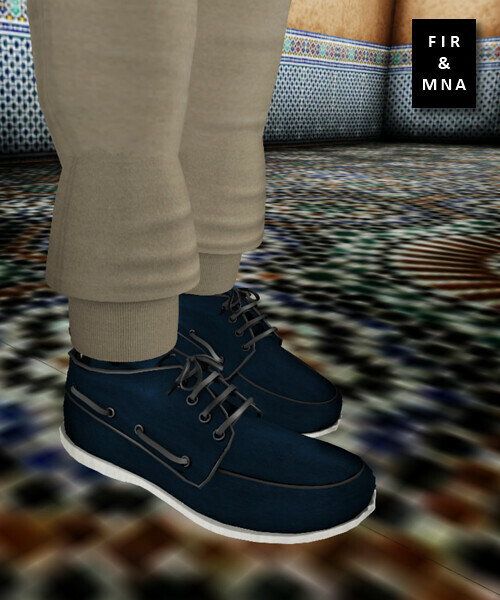 Please note that all photographs of the boots are raw inworld shots! I sound like I’m overanalysing, but I’ve been trying my hand at sculpting lately(fail) and it makes me admire creators even more. It’s fun to look at pieces and think about the detail that went into them though. Everyone should try sculpting so that we’ll never complain about paying “too much” for items ever again, it’s only after making an attempt that I realized the crazy amount of work that goes into it. Close-up of Lochdon Boot in coal, with tan lining. Notice the stitching! Some colors of the Lochdon Boot, with different lining options. Another feature of the boots is the fact that they come with three different options for the inner lining! Trace chose colors that suited the base color of the boot, you get different color sets for every base color that you purchase. My favorite combinations are the boots with tan inner lining, I think those really stand out. Each color is just 275L which I thought was super reasonable for the quality and combinations they come with. Try demos at Theosophy and take a look for yourself! Gorgeous poses from Del May, always inspiring! More of the Gypsys bows! Super pretty. They come in a set with a matching ribbon necklace. I’m wearing it with a kik hair that has a headband attached! Still in love with the Michami Pia cutout leggings, I think they’ll always be my favorite and the most versatile/unique leggings that I own. I like the colors that they come in and I’ve never seen anything like them anywhere else. They also come with sculpted cuffs! The R.icielli dress was 65L for two different studded jackets, a hot pink minidress and a pink sequined bra. And a lavender jumpsuit thing. All of that for 65L at The Dressing Room! I thought really carefully before I got it because I wanted to make sure that I would use all the items, but I really love R.icielli’s chic jackets anyway. And I love pink. And now I love R.icielli for giving us this awesome 65L promotion for TDR! Really happy with the eyeliner I made ages ago, it’s the kind of eyeliner that’s kind of skanky and popular over here and I wear it most of the time in real life, so.. I really like it in SL! So much easier to throw eyeliner on in SL, I can never get it perfectly right on the first try irl. And sorry for the self praise LOL. eyeliner from actchio! I took these photos at my home with stax, love living with friends! That’s Valetta Gossipgirl‘s pretty house in the distance, my lovely neighbor! The trees with sparkling lights are only 3 prims and from MDRM, they are the best trees in the world. The bar and alchohol are also from MDRM. My life and money is spent on perpetually going to MDRM and ARIA and buying things. Hello! Sharing a darling bow from Gypsys! a store that’s new to me! I was itching for new bows to wear in my hair and these are really detailed ribbon sculpts with floral/vintagey textures. The bows come in a set with a matching bow necklace! I’m wearing the set in orange. The Reek Papercut cardigans are also all snuggly and the color is perfect, I’m wearing it in lime green. Really realistic textures and lovely baked shadows even on the pockets. Long cardigans are all the rage here and I wish we had (affordable) fatpacks in real life! Background: ARIA living room, photo taken with kind permission from Yelo Uriza. I bought the lamps in the background a long time ago and I’ve used them in almost every house I’ve lived in, they are just one prim and beautifully made. Shane & Clear: LES GIRLS! Stella Semaphore: wears Cheap Makeup!